German translation of the article can be found here. You can translate the article into your native language in order to get the program's registration for free. Nobody will likely dispute the fact that Internet Explorer is today's most popular Web browser. According to the statistics, approximately 70% of online users prefer to use just this program. Arguments about its pros and cons may last forever; still, this browser is the leader of its industry, and this is a fact that requires no proof. Internet Explorer carries several built-in technologies, designed to make the average user's life easier. One of them - IntelliSense - is made for taking care of the routine tasks, like the automatic completion of visited webpage addresses, automatic filling of form fields, users' passwords, etc. Many of today's websites require registration, which means, a user would have to enter username and password. If you use more than a dozen such websites, you will likely need a password manager. 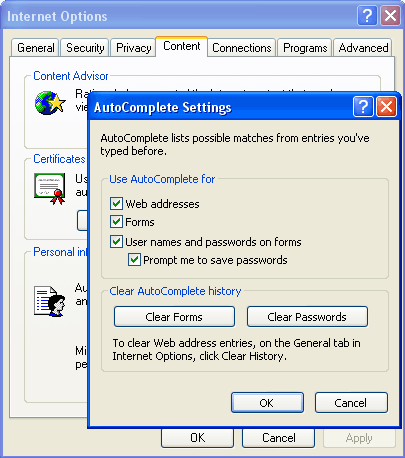 All modern browsers have a built-in password manager in their arsenal, and Internet Explorer is not odd. Indeed, why would one have to remember yet another password if it is going to be forgotten some time soon anyway? Much easier would be to have browser do the routine work of remembering and storing passwords for you. It's convenient and comfortable. Each software developer solves the forgotten password recovery problem in their own way. Some of them officially recommend copying a couple of important files to another folder, while other send all registered users a special utility that allows managing the migration of private data, and the third ones pretend they are not seeing the problem. Nevertheless, the demand creates the offer, and password recovery programs are currently on a great demand. AutoComplete data (passwords will be covered further) are also stored in the Protected Storage and appear as lists of HTML form field names and the corresponding user data. For example, if an HTML page contains an e-mail address entry dialog: once a user has entered his e-mail address, the Protected Storage will have the HTML field name, the address value, and the time the record was last accessed. The HTML page title and website address are not stored. Is that good or bad? It's difficult to determine; more likely to be good than bad. Here are the obvious pros: it saves free space and speeds up the browser's performance. If you think the last note is insignificant, try to imagine how you would have to perform several extra checkups in a multi-thousand (this is not as rare as it may seem to be) auto-fill list. Another obvious plus is that data for identical by name (and often by subject) HTML form fields will be stored in the same place, and the common data will be used for the automatic filling of such pages. We will see this in this example. If one HTML page contains an auto-fill field with the name 'email', and user entered his e-mail address in that field, IE will put in the storage, roughly, 'email=my@email.com'. From now on, if the user opens another website, which has a page with the same field name 'email', the user will be suggested to auto-fill it with the value that he entered on the first page (my@email.com). Thus, the browser somewhat discovers AI capabilities within itself. The major drawback of this data storage method comes out of its advantage that we just described. Imagine, a user has entered auto-fill data on a webpage. If someone knows the HTML form field name, that person can create his own simplest HTML page with the same field name and open it from a local disk. To uncover the data entered in this field, such a person will not even have to connect to the Internet and open the original WWW address. FTP site passwords are stored pretty much the same way. It would be relevant to notice that beginning with Windows XP FTP passwords are additionally encrypted with DPAPI. This encryption method uses a logon password. Naturally, this makes it much more difficult to recover such lost passwords manually. Since now, one would need to have the user's Master Key, SID, and the account password. And the last item on our list is Content Advisor password. Content Advisor was originally developed as a tool for restricting access to certain websites. However, for some reason, it was unloved by many users (surely, you may disagree with this.) If you once turned Content Advisor on, entered a password and then forgot it, you will not be able to access the majority of websites on the Internet. Fortunately (or unfortunately), this can be easily fixed. Advanced Internet Explorer Password Recovery from the not unknown company, ElcomSoft - does not recognize AutoForm passwords and encrypted FTP passwords. Not to be excluded, the last version of the program may have learned to do that. Simple, convenient user interface. The program can be upgraded online automatically. 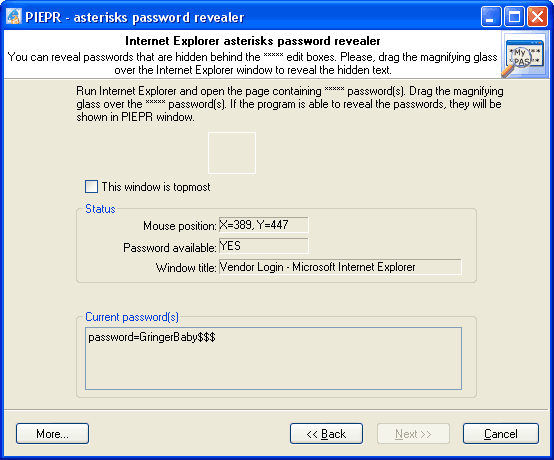 Internet Explorer Password from Thegrideon Software - not bad, but can recover just three types of Internet Explorer passwords (this is enough for the majority of cases.) 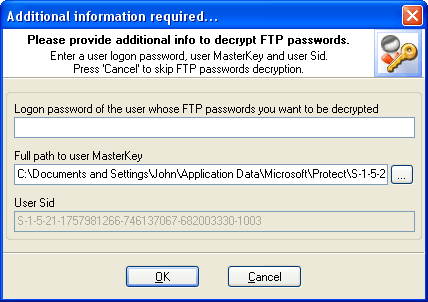 Deals with FTP passwords properly. Version 1.1 has problems recovering AutoForm passwords. Has a convenient user interface, which in some way reminds one from AIEPR. One can be totally overwhelmed with the beauty and helpfulness of the company's website. 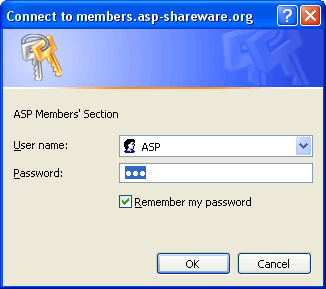 ABF Password Recovery from ABF software - quite a good program with a friendly user interface. The list of IE record types supported by the program is not long. Nevertheless, it deals with all of them properly. The program can be classified as a multi-functional one since it can restore passwords for other programs also. The major drawback of all programs named here is the capability to recover passwords only for the user currently logged on. So, until the very recent time, all programs for recovering Internet Explorer passwords used those undocumented API. That's the reason why one significant restriction was applied to the recovery work: PS API can only work with passwords for the user that is currently logged on. When the system encrypts data stored in Protected Storage, besides everything else it uses user's SID, without which it is literally impossible (taking into account the current level of computers' calculating performance) to recover stored passwords. First, Protected Storage is based on module structure, which allows plugging other storage providers to it. However, for the last 10 years, while Protected Storage exists, not a single new storage provider was created. System Protected Storage is the only storage provider in the operating system, which is used by default. Third, it is not very clear why MS has decided to decline Protected Storage in storing AutoComplete data and passwords. Decline it as a tried and true data storage, and not data encryption mechanism. It would be more logically proven to keep Protected Storage at least for storing data when implementing a new encryption algorithm. Without fail, there were weighty reasons for that. Therefore, it would be interesting to hear the opinion of MS specialists concerning this subject matter. One of the listed SIDs will contain data left by the old Windows 9x/ME. That data is additionally encrypted with the user's logon password, and PIEPR currently does not support the decryption of such data. Normally, the program finds the last two items in the user's profile and fills that data automatically. However, if ntuser.dat was copied from another operating system, you will have to take care of that on your own. The easiest way to get the job done is to copy the entire folder with user's Master Key (there may be several of them) to the folder with ntuser.dat. Master Key resides in the following folder on your local computer: %SYSTEMDRIVE%:\Documents and Settings\%USERNAME%\Application Data\Microsoft\Protect\%UserSid%, where %SYSTEMDRIVE% stands for the system disk with the operating system, %USERNAME% - account name, %UserSid% - user's SID. For example, the path to the folder with a master key may look as follows: C:\Documents and Settings\John\Application Data\Microsoft\Protect\S-1-5-21-1587165142-6173081522-185545743-1003. Let's make it clear that it is recommended to copy the entire folder S-1-5-21-1587165142-6173081522-185545743-1003, for it may contain several Master Keys. Then PIEPR will select the right key automatically. CA passwords, as it was said already, is not kept as plain text; instead, it is stored as a hash. In the CA password management dialog, it is enough to just delete (you can restore the deleted password at any time later) or change this hash to unlock sites locked with CA. PIEPR will also display your password hint if there is one. 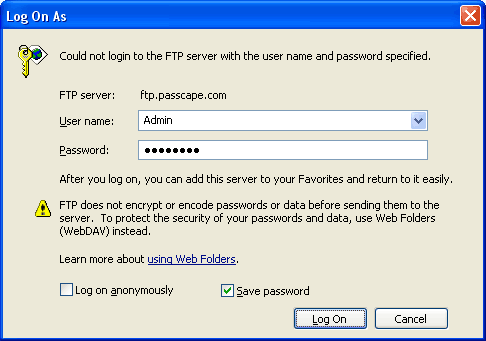 When opening an FTP site, Internet Explorer pops up the logon dialog (Figure 5). As we see, the decryption of the current user's password should not cause any special difficulties. 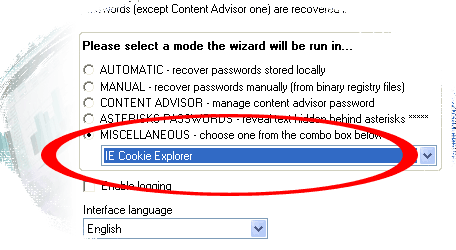 Oh, if the password is not found for some reason - don't forget to check IE's Auto-Complete Settings (Figure 2). Possibly, you have simply not set the program to save passwords. This is a typical, but not a fatal situation. The necessity to recover Internet Explorer passwords after unsuccessful Windows reinstallation occurs just as often. In either case, we will have the user's old profile with all the files within it. This set is normally enough to get the job done. In the case with the reinstallation, Windows providently saves the old profile under a different name. For example, if your account name was John, after renaming it may look like John.WORK-72C39A18. Open the program's wizard in the manual mode and enter the path to the old profile's registry file. In our case, that is C:\Documents And Settings\John.WORK-72C39A18\ntuser.dat. Where John.WORK-72C39A18 is the old account name. Click 'Next'. Normally, the program finds the last two items in the user's profile and fills that data automatically. However, if that didn't happen, you can do that by hand: copy ntuser.dat and the folder with the Master Key to a separate folder. It is important to copy the entire folder, for it may contain several keys, and the program will select the right one automatically. Then enter the path to ntuser.dat that you have copied to another folder. Cookies are often encrypted. In this case, you are not likely to succeed in recovering the password. The only thing you can try doing in order to recover the old account is to create a new account. Then you will be able to copy the old cookies in a text editor and replace them with the new ones. However, this is only good when the worst comes to the worst; it is not recommended to use it normally. 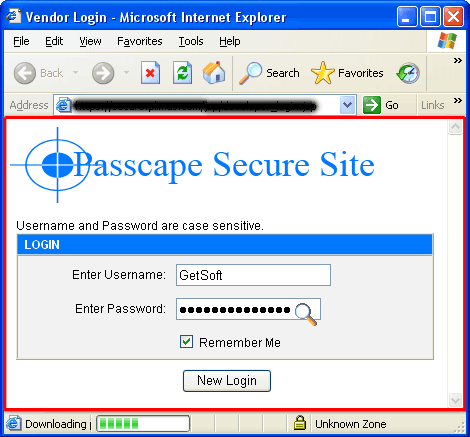 As this article shows, recovering Internet Explorer passwords is a pretty simple job, which does not require any special knowledge or skills. However, despite the seeming simplicity, password encryption schemes and algorithms are very well thought through and just as well implemented. Although the Protected Storage concept is over 10 years of age, don't forget that it has proven the very best recommendations of the experts and has been implemented through three generations of this popular browser. *1 Human's memory can be split into two categories: short-term memory and long-term memory. For the purposes of memorizing information, human beings activate short-term memory, which is characterized by limited volume. When the volume is overloaded, new information that enters the memory, partially pushes the old information out, which permanently disappears. To store information in the short-term memory, one needs to keep constant attention to the material being memorized for the entire period while the material is to be in the memory. If one doesn't repeat the information stored in the memory for a certain period of time (e.g., a new password), that information can permanently or fragmentarily fall out of the conscience sphere and never end up in the long-term memory.